A ColecoVision emulator for the PocketPC! If you have problems getting this software to work, please read the notes at the bottom of this page prior to emailing! NEWS: March 30, 2002: Version 1.0b is ready. This is a beta version of 1.0 Final, and should work on every PocketPC out there. Key control setting has been improved, and can now detect all possible buttons. There is no need for the coleco.rom file. There have also been a number of tweaks and improvements. Please let me know if there are any problems with the beta version before June 1,2002. - Full 4 voice sound implementation, with volume, sample rate, and buffer size controls. - Autofire support for both A and B fire buttons, individually. Pressing the fire key while this feature is enabled will function as "stop firing"
- Full control over processing time during Horizontal and Vertical Sync. -Some saved games may need to be reloaded with skipframes set to 0, or graphic glitches will be seen. 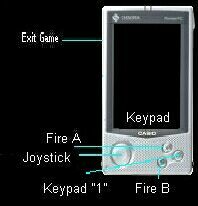 - The Keypad is needed for starting most games, and is on-screen. v0.80: November 5/01 - Support has been added for user configurable controls, reseting the system, and preliminary support for monochrome devices. v0.70: August 01 - Not released... Control settings and a few bug fixes. v0.65: June 3/01 - adds speed control (iPaq! ), adds control over sound mix mode, changes the gamestate file type to .css, and incorporates a few bug fixes. v0.60: June 2/01 - New keypad, Save/Load States, more options, improved sound, minor bug fixes. PocketColeco is my second public project for PocketPC, ported from the amazing emulator ColEm created by Marat Fayzullin. This project is open source, under the GNU Public License, and others are encouraged to offer improvements, and other PDA device builds. Currently the emulator runs several hundred games at playable rates. This emulator was started in April 2001, and is still in it's infancy, hence version 0.5. Sound is now running, but not fully optimized, and some peripherals like the super controllers are not implemented at this time. 1. These zips contain .exe files compiled for PDAs. They must be manually copied to your device. 2. Roms must be located under "\My Documents", or one of its subdirectories. If you are placing roms on a CF card, create a directory of this name first. 4. In case you really mess things up, and can't remember what you did...delete the file "Pocketcoleco.set" from your PDA's root directory! ARM Version 1.0 beta Binary (72.5K) - Compaq iPaq, AERO! Email me if this does not work on your monochrome device. Support for these is in beta testing. For educational purposes, older version source codes and binaries can be obtained directly from the author, please email stu.russell@rogers.com.